How many calories are you getting from the bun? I use my panini grill for a quick burger and I spread old fashion mustard. It gives a nice tangyness to the sandwich. You will most definitely need some type of fat on there if you want to absorb the nutrients from the other ingredients! It probably would't hurt to splurge on a little cheese for extra protein or even make a homemade yogurt dressing to go on it. Plus since mushrooms,especially portabellas,have vitamin D which will help the body absorb the calcium. I've also heard of recipes using portabellas in place of buns with lean meat or veggie burgers for those on low carb diets or to save calories. @Karen - Thanks! I fixed my twice mentioned spinach and I do think they would be great on a George Forman grill. Go for it! @Jenn - I calculated the bun at 100 calories - but the one in the photo is 140. So it is 140 calories without the bun for each burger. Thanks for the question! The Food and Drug Administration (FDA) in the USA has been seeking a natural, non-animal food, rich in Vitamin D. That led them to mushrooms. It has been demonstrated that when white button mushrooms are exposed to Ultraviolet B radiation, for a short period of time, the level of Vitamin D increases to levels many times the minimum daily requirement, i.e. 10 mcg. Normally, a serving** of white button mushrooms contains 18 IU (0.45 mcg.). Treated mushrooms contain over 80 mcg. ***" Here's that full article, too: http://themushroomlady.blogspot.com/2008/02/mushrooms-and-vitamin-d.html Hope that helps! what to do besides slicing and sauteing with onions. I will definitely try your recipe! 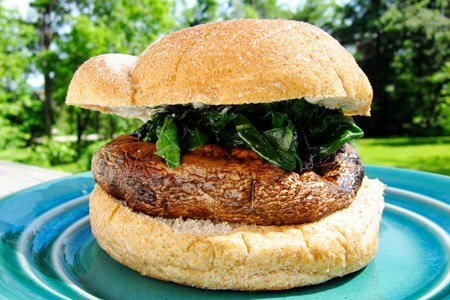 Try a grilled portobello mushroom as the bun! We grilled one of these with a salmon burger pattie and topped with fresh diced avocado, cherry tomato, fresh cracked black pepper and fresh squeezed lime juice. It was so yummy! I make sandwiches like this routinely and they are DIVINE. Mushrooms are truly one of nature's finest food gifts. Portobello burgers are simply delicious! Thanks for the recipe!! I cook mine in the oven at 350 for about a 1/2 hour. Season it first. Cook in a shallow dish, as moisture will be released. Also, I only pay about $1 for them - I get them loose and it costs about $4 a pound. I don't eat meat, nor do I think these taste like meat, but it is great to have a big sandwich. I'll put anything on it that I would put on a burger. It makes a great dinner. The portobello is great on the grill or in a basket with veggies on the grill. It works on the foreman grill but don't push down too hard on it and time it to avoid overcooking. Ok that looks delicious and I love mushrooms. I may have to to whole foods tomorrow and try their mushroom burger. Been eating these for years, but using a little different recipe. I use a little olive oil, garlic, fresh thyme, basil and oregano and just before they're done a splash of red wine or balsamic vinegar. I also rarely use a bun, just eat it like a steak. Portobello mushroom provides several dietary benefits that helping you meet your daily needs. It is also an effective addition to a weight-loss diet. Thanks for your nice blog! I'd rather ditch the bread than the beef. I think a burger served on a grilled mushroom cap would be great. I've been eating Portobella Mushroom as a burger for quite sometime. Nothing really replaces meat though, but it's good in a pinch and is quite filling. I love it with avocado and a small bit of cheese.